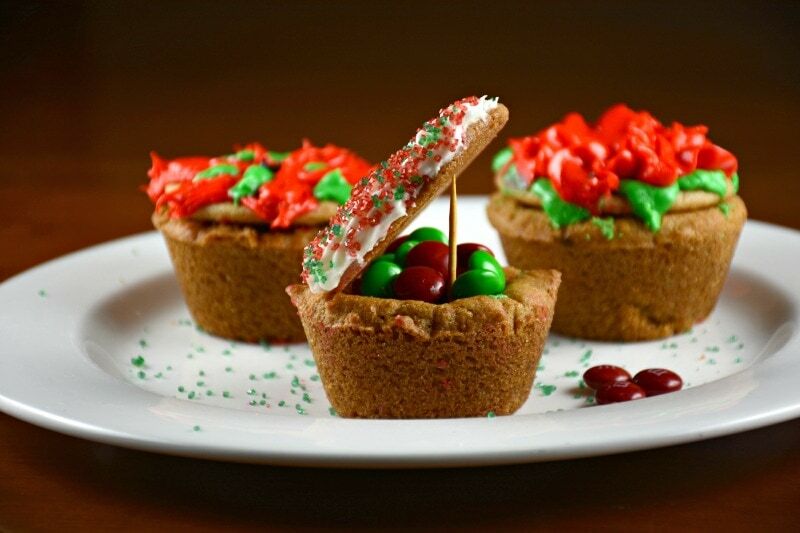 These Holiday Surprise Basket Cookies are so versatile! They can be filled with anything and decorated in so many ways. Every year we hide something different inside for Christmas morning. The kids decorated them, they just didn’t know what was going to be put inside them! Most families leave cookies for Santa and we left him one of these! These cookies are delicious. In a large bowl (ideally with an electric mixer) cream together the butter and sugars on medium speed until combined. Blend in the eggs and vanilla. Scrape down the sides of the bowl as needed. Next with the mixer on low speed, add the flour, baking soda and baking powder until combined. The cookie batter will become very thick. You can either bake immediately or cover and refrigerate at least an hour, up to overnight. I prefer baking with chilled dough but it is not necessary with this dough. Preheat oven to 350 degrees. Split your dough into 3 equal pieces, approximately. Next combine 2 of the pieces into one. Now you have a large piece and a small piece. Prepare a regular sized muffin pan (holds 12 muffins) with cooking spray. Using the larger piece of dough press each cookie basket into each cup so it lines the bottom and sides of the tin. You have to press the dough as thin as possible into the sides and bottom of each muffin cup. Bake for 13-16 minutes or until golden brown and the bottom of the cup looks somewhat cooked. The dough will fall slightly to the center of each muffin while baking. This is ok. Remove from oven and cool in the muffin tin for at least 5 minutes. Once cups are cool fill them with anything you want! Prepare a rimmed baking sheet with cooking spray and set aside. Grab your remaining small piece of dough. Using a rolling pin lightly flour your work surface and roll the dough out flat, about 1/4 of an inch thick. Using a glass or a cup that is about the same size as the opening as your muffin tin, press into your dough and make as many round cookies as needed to cover or become the top of each of your cookie baskets. Bake for 8-10 minutes. Allow to cool and then decorate the tops with icing and/or sprinkles as well. Decorate and then place a flat cookie on top of each basket. Serve and enjoy! How fun! You could hide all types of goodies inside. Have a great time with the family. These are so freaking cute! Such a great kids craft, you can put anything you want in them! I love this creation! How fun is it that the kids get to decorate them, but still end up being surprised in the end?! My daughter is going to love these. These are the cutest! And you have made skills with the icing sugar decorations too! This is a super cute idea and a great way to get the little ones involved in the kitchen! Happy Holidays! What a fun recipe! I bet you could fill the “baskets” with really anything small- candy coated sunflower seeds, anyone? 🙂 Great idea! Great idea ! My daughter would love them ! It’s perfect for kids’ party ! Thanks for sharing ! What a cute idea. I bet the kids would LOVE these, especially with m&m’s (but no blue one’s please). They are all over anything that has a surprise inside.